In today’s celebrity-obsessed world, it can seem like the keys to looking great are high-priced dermatologists and plastic surgeons. Rest assured that in the real world, the words pregnancy and beauty can be used in the same sentence and there are much less drastic measures that you can take to achieve stellar results. By following a few simple tips and tricks, you can face every day looking your best and glowing like every healthy soon-to-be Mommy should. It’s the easiest way to get glowing skin, but it’s also the most overlooked. Aim for eight glasses of water each and every day and you’ll feel the benefits immediately. Staying hydrated will keep your skin soft and supple and give you energy throughout the day. By keeping hydrated, you’ll avoid the mid-afternoon slump and feel more inclined to be physically active. Drinking water in place of sugary fruit drinks and sodas will also cut down on unhealthy calories. Most importantly, water helps maintain sufficient amniotic fluid in the sac, allowing your baby to grow comfortably. Sunscreen may be the most important weapon in your beauty arsenal. The damaging rays of the sun will cause wrinkles, dark spots and uneven tone if your skin is not protected. Be sure to always wear a broad-spectrum sunscreen that protects against both UVA and UVB rays. Stuck with an SPF of 30 or higher. More and more daily face moisturizers are including SPF in their formulas, making it effortless to stay safe from the sun. Now that you’re going to be a mother, your long-term health is even more important. Don’t forget to apply sunscreen to your neck and the backs of your hands as well. Those are two areas that can age just as quickly as your face if you don’t keep them protected. We all know the harmful effects of sun exposure on our skin, but did you know that there’s a healthy way to achieve a glowing tan without the sun? Just eat a diet that includes beta-carotene, an orange plant pigment that creates a glow from the inside. Foods rich in beta-carotene include carrots, sweet potatoes, butternut squash, kale, spinach and turnip greens. Beta-carotene can give your skin and face a golden tan that is perceived as more attractive and healthy than a suntan. 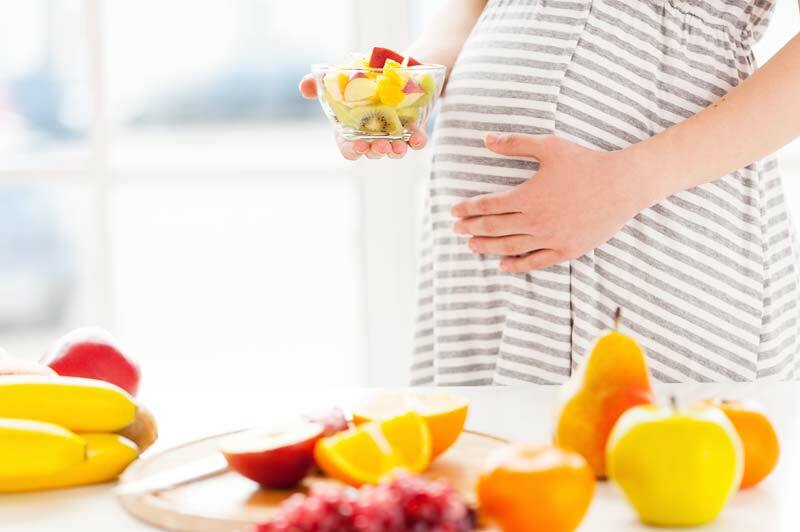 These healthy foods also provide excellent nutrients for your growing baby! There’s a reason they call it beauty sleep! A well-rested body is a beautiful body, both mentally and physically. Don’t overestimate the importance of getting seven to eight hours of quality sleep. If you have trouble falling asleep at night, be sure to refrain from eating or drinking for a couple of hours before bedtime. Then turn off your laptop, notebook or phone, and put away the baby books at least half an hour before you go to bed. This will give your brain time to settle down for the night. There are also some sleep tricks that can make sure you wake up looking your best. Remove your makeup and wash your face before going to bed. Also, try to wash your pillowcase twice a week. These steps will ensure that your pores stay clean and your complexion stays clear. It’s not unusual to wake up with puffy eyes. They can be brought on by allergies or a lack of sleep, among other things. Rather than relying on expensive eye creams and messy cucumber slices, try the spoon trick. Simply put two metal spoons in the refrigerator and place the backs on your eyes when you wake up. You’ll instantly reduce the puffiness, and the cold will help you feel alert! While we’re on the subject of tableware, let’s talk about plates. Oversized plates might be all the rage in modern kitchen décor, but they can wreck your diet. Portion control is important when it comes to maintaining a healthy weight, but it can be hard to know what an appropriate portion is when your dishes are huge. Don’t take the drastic step of opening up those kiddie plates you received at your baby shower, but instead try using a salad plate when sitting down to dinner to keep your portions in check. Now that you’re using an appropriately sized plate, be sure to fill it with a healthy meal. The USDA recommends that you fill half of your plate with fruits and vegetables, make at least half of your grains whole grains, and keep meat and poultry portions small and lean. Visit their website, www.choosemyplate.gov for more healthy recommendations, including recommendations that are targeted to pregnant women. Whole grains like brown rice and whole wheat bread are a healthier alternative to refined grains because they offer more vitamins and minerals. They also offer more dietary fiber, which is thought to lower the risk of heart disease, diabetes and obesity. Fiber also keeps you full, keeping you safe from junk-food binges. Aim for a variety of whole grains, such as barley, buckwheat and oats for maximum health benefits. Remember, you’re eating for two now so every choice counts!